I’d be remiss if I only told you about the dinner I had at Islands Dining Room in Orlando without mentioning the desserts! This was the sampler tray that we were served. 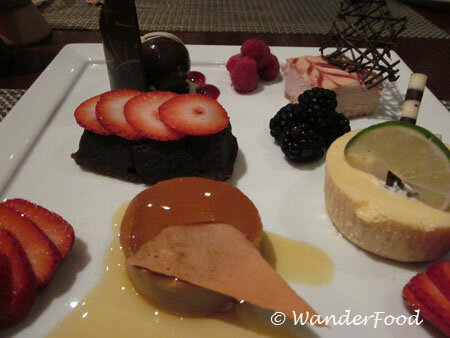 It included: Guava Flan, Strawberry Cheesecake, Key Lime Pie, a Chocolate Truffle and rich Chocolate Cake. I’m still trying to figure out how it is that a person can be full from dinner yet still find room for what is surely the most caloric course of any meal!